MORRISTOWN, NJ--(Marketwired - Jun 29, 2017) - The renowned general, restorative, and cosmetic dentists at Aesthetic Smiles of New Jersey recently collaborated with the team at Rosemont Media -- a San Diego-based digital marketing firm -- to provide patients with an all-encompassing informational resource detailing the range of oral health services offered at their Morristown practice. Together, they modernized Aesthetic Smiles' online presence with a sleek website design that showcases custom-built features, allows for easy navigation, and enhances the overall patient experience. 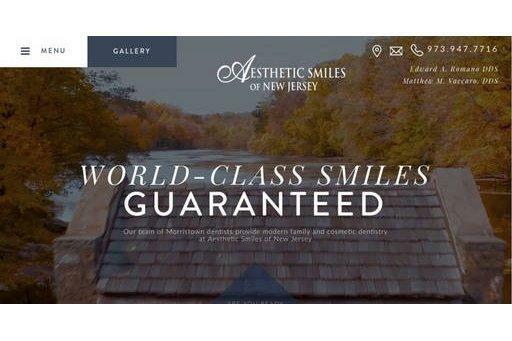 Aesthetic Smiles of New Jersey has worked with Rosemont Media for a number of years and recently unveiled their second generation website. The new design boasts a one-of-a-kind navigation menu that functions like an opening door, inviting current and prospective patients into the practice's refreshed, welcoming setting. Detailed information on dental procedures -- both common and unique -- are exhibited on a range of exciting multimedia features. Additionally, patients can now access comprehensive material on many different treatments, including porcelain veneers, Invisalign®, sleep apnea, and TMJ disorder. In this way, the website communicates a bevy of new information, not only pertaining to the range of routine, aesthetic, and restorative services offered by the practice, but also relevant to the maintenance of exceptional oral health and general wellness. The fully responsive site utilizes smart navigation and is displayed beautifully across a plethora of platforms, including phones, tablets, laptops, and desktop computers. This accessibility ensures an enriching user experience on any device, regardless of screen size. Patients seeking additional information now have new, interactive ways to learn about their treatment options with features such as a before-and-after photo slider, comprehensive photo gallery, detailed procedural videos, and relevant informational blogs that are updated consistently. Up-to-date patient reviews and practice ratings gathered across all major platforms (including Facebook, Google+, and Yelp) can also be found in one location. This ease of access allows individuals to make a more informed decision about their treatment choices without sacrificing time or convenience. Drs. Romano, Vaccaro, and Bizzarro also sought to extend their online visibility, a feat that was achieved by incorporating the latest best practices in search engine optimization and content marketing. Combined, these advanced strategies ensure the site is appearing prominently on all major search engines so a variety of audiences are able to reach the practice's unique content. Ultimately, the functional design and digital marketing strategies implemented into the new website allow the practice to better connect with current and prospective patients, while providing individuals with vital information to enhance their oral health. Dr. Edward Romano is a 20-year sustaining member of the American Academy of Cosmetic Dentistry, and formerly served as a President of the organization's New Jersey chapter. He is currently in private practice, and maintains membership in the American Dental Association and the American Academy of General Dentistry, among many other affiliations. Dr. Romano holds the title of Dental Ambassador at Dawson Academy and has been featured on a number of media outlets, including CNN, CNN International, MSNBC, WPIX, and the Better Homes and Gardens Network for his proficiency in laser dentistry and other advanced dental techniques. Dr. Romano is available for interview upon request. Dr. Matthew Vaccaro is a member of the American Academy for Cosmetic Dentistry, American Dental Association, Academy of General Dentistry, and Tri-County Dental Society. During his time at the State University of New York in Buffalo, Dr. Vaccaro was the recipient of awards in dental implant placement and prosthodontics. He is also a graduate of Dawson Academy and the Rosenthal Institute for Aesthetic Dentistry. In addition to being in private practice, Dr. Vaccaro is currently on staff at the Morristown Medical Center, where he provides instruction in many aspects of dentistry, including cosmetic treatments and CEREC® techniques. Dr. Vaccaro is available for interview upon request. Dr. Robert Bizzarro is a graduate of the New Jersey Dental School and belongs to a number of professional dental organizations, including the Academy of General Dentistry, American Dental Association, NJ Dental Association, and Tri-County Dental Association, among others. Dr. Bizzarro completed his general practice residency at Morristown Medical Center under the mentorship of Drs. Edward Romano and Matthew Vaccaro, and now serves as an attending doctor at the facility's General Residency program in addition to his work at Aesthetic Smiles of New Jersey. Dr. Bizzarro is available for interview upon request. For more information, please visit aestheticsmilesofnj.com or facebook.com/AestheticSmilesOfNJ.